There are many jewelry stores in the Valley of the Sun, Mesa in particular. As the largest city in the East Valley, its patrons are always looking for a jewelry store to call their own. Yet there is one jewelry store Mesa locals also know as their favorite pawn shop: Oro Express Mesa Pawn and Gold! What Makes A Pawn Shop A Jewelry Store Also? The mere fact that Oro Express Mesa Pawn and Gold boasts an astounding inventory of silver, gold, platinum, and diamond jewelry means we may just be more of a jewelry store than others in Mesa, Tempe, and Chandler. Our pawn shop is in the business of lending money to those in financial distress, and the most popular way to do this is with jewelry. The value that gold, silver, and diamond jewelry has alone allows our customers to get hundreds, sometimes thousands of dollars with a jewelry loan, or through selling jewelry. This has allowed us to amass a huge array of jewelry in our inventory for customers to buy. What’s more is that our pawn shop has far lower prices than you’ll find at the traditional jewelry store in Mesa, Tempe, or Chandler. Due to the fact that when we do jewelry loans, or are a jewelry buyer, we pay based on the amount of the precious metal and not the aesthetic value, our prices are extremely competitive and oftentimes less than 50% of what the actual retail value would be. We’re Mesa’s jewelry store, and no matter if you’re selling jewelry, buying jewelry, or looking to get a loan on your jewelry, there’s only one place you should stop. What Kind of Jewelry Store Are You? WAt Oro Express Mesa Pawn and Gold, we don’t discriminate, Gold jewelry, silver jewelry, platinum jewelry, diamond jewelry — all of it is good for cash or for purchase at our Mesa pawn shop. Even when it comes to other precious stones like rubies, sapphires, and emeralds, we’re happy to sell and buy. Many stores find specialties like only dealing in diamond jewelry, meaning they won’t even consider emerald or sapphire jewelry. We believe that every one of our customers should have access to fast cash for their jewelry, and also the ability to purchase whatever kind of jewelry they’re looking for. Where this also sets us apart is when it comes to Native American Jewelry. This type of jewelry is primarily made of silver and turquoise, two less expensive metals/stones, yet at Oro Express Mesa Pawn and Gold, we love it! 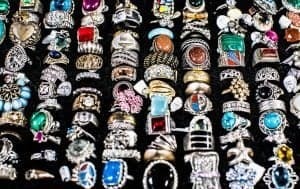 If a customer is selling jewelry, pwning jewelry, or looking for a jewelry loan, we’re happy to take any and all kind of jewelry, including Native American, at our store. We believe that the residents of Mesa, Tempe, and Chandler deserve access to cash for their jewelry no matter the type making us the leading jewelry store in Mesa. What Jewelry Store Services Do You Offer As A Pawn Shop? Yes, we do offer a multitude of services that you will not find in the traditional jewelry stores Mesa locals frequent. For example, we offer pawn loans for your jewelry, such as estate jewelry loans, diamond loans (loose or jewelry), gold loans (loose or jewelry), more. We also offer services outside of jewelry, such as pawn loans for general items, or title loans from vehicles you own. Finally, we’re a buyer of jewelry too. Specifically, our jewelry loans are collateralized loans in which customers can use their jewelry as “security” for the cash loan. Unlike traditional loans from financial institutions, this allows us to ignore things like income, and credit score. As long as a customer has a piece of silver, gold, or diamond jewelry, then they can get a pawn loan and walk out of our store with cash in hand. What’s important for potential jewelry loan customers to know is that your items are not only safe and secure, but can be returned to your possession in 90 days or less. All of our loans are written for that long, so if you can pay it off in that time frame, it’s all yours. Lastly, we’re the top jewelry buyer in Mesa, Tempe, and Chandler. As discussed above, we deal in all kind of jewelry including silver, gold, diamond, and Native American. We pay the most cash out of any jewelry store or pawn shop in the Valley of the Sun, and take our time to ensure a thorough and detailed approach to ensure our customers are getting paid the most cash possible. Oro Express Mesa Pawn and Gold is more than happy to offer free jewelry buying or pawning jewelry quotes seven days a week to find the financial option that is best suited to you. That’s Quite the Array of Services! Indeed. That’s how we managed to remain in successful operation for over several decades in the process. But the one thing most people overlook with a pawn shop, ours included, is that we are a STORE. Stores have to provide product to sell, and as such, we provide jewelry to customers that desire to buy them. And while we have you, check out our other selections that we have in store. Stop by today and see how we’ve become the jewelry store Mesa locals love to talk about! What separates us from the competition is this wide array of services. It allows us to truly get our customers out of whatever financial disparity they find themselves in as we can not only deal in jewelry, but any other valuable items they might have. If you’re looking for a set amount of money from our Mesa pawn shop, then we always advise our customers to not only bring in their gold and diamond jewelry, but additional items as well. We’ll only loan on what you want us to, or what is necessary to get you the exact fast cash you need. If you’re in Mesa, Tempe, or Chandler, there’s only one pawn shop you should consider for all your jewelry buying and loaning needs.